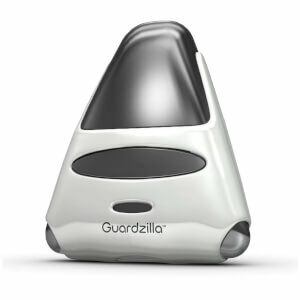 Guardzilla is an all in one home security system. Simply plug in and sync to your Wi-Fi, Guardzilla's app is highly customizable allowing the owner to use the device in a number of ways. 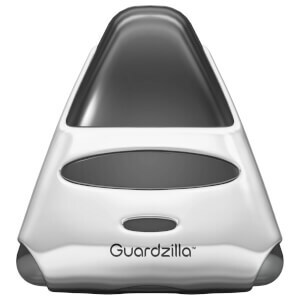 Guardzilla's camera will show a live feed of what it sees, but once armed will send you notifications if its motion detection senses a disturbance. Other features include a 100dB siren, infrared night vision, pet immunity, auto arming and disarming, and two-way audio just to name a few. For indoor use only. Discreet surveillance, live video monitoring from your smartphone. Individuals can protect their home, loved ones and pets with Guardzilla, an easy-to-use, customisable security system that streams video to users’ smartphones in real-time and captures pictures. The motion sensor and siren capabilities allow Guardzilla to identify and deter unwanted intrusions. As soon as you plug in your Guardzilla and download the companion iOS/Android app, you are ready to begin monitoring your home. The Guardzilla app features geo-fencing, which automatically arms and unarms the device when you approach your home. Gone are the days of having to remember to deactivate your home security system every time you enter your home. The app allows you to personalise how and when you are notified, as well as watch video of your home in real time. Multiple phones can access the same Guardzilla device, which makes Guardzilla ideal for roommates, husbands and wives and kids coming home from school. The motion sensor and siren capabilities allow Guardzilla to identify and deter unwanted intrusions. It’s peace of mind. Two million homes are broken into annually and homes without security systems have close to a 300 per cent increased risk. Most convicted burglars (90 per cent) said they want to avoid homes with alarm systems and said if they did encounter an alarm, they would abandon the attack on the home. Only 13 per cent of burglaries are cleared by police and recovering victim’s property is even less likely to happen.